As a Tuesday bonus, we are going to share a couple of pictures to follow up on yesterday's post on our short trip to Celebration, Florida. The first is something we all see every day - the back of a stop sign. 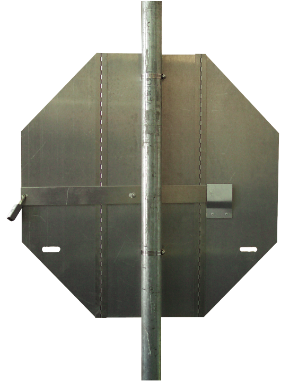 I had a hard time finding a picture of one on Google since very few people would ever take a picture of the back of a stop sign. Why would you - it's not like they are an attractive element of a neighborhood. Now check out this pic from downtown Celebration. Here is the caption posted in the Facebook album we created to document the tour. 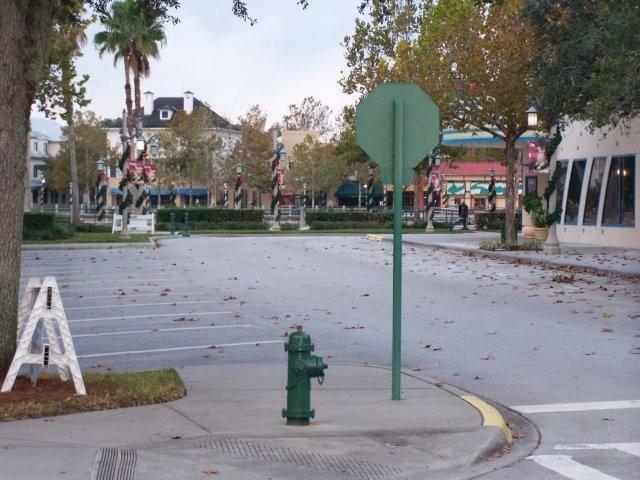 Massive attention to detail - note how they paint the rear of the stop signs, along with the fire-hydrants, a dull and inconspicuous shade of green (instead of shiny tin on the sign and red or yellow for the hydrant). The idea here is that they don't want to draw your eye to the ugly back of the sign, so they just paint it something that does not draw the eye. On the Community Growth Institute fan page on Facebook we have posted forty photos along with a frame-by-frame narrative of our recent walking tour of Celebration. On off-days in the coming weeks (we typically post Mondays, Wednesdays and Fridays here at STB.org) I'll continue to post tidbits here for those not on Facebook. While we won't change the fate of humanity simply by painting the back of our STOP signs, changing the small ways in which we look at our neighborhoods is a first step towards building Strong Towns. Tomorrow's post will be on the concept of "buying local". In the meantime, continue this Strong Towns conversation by posting a comment or by joining us on Facebook. You can also follow Strong Towns on Twitter. We appreciate all of the support.